Moong dal (payatham paruppu) tadka is one of my comfort food. It tastes good with rice as well as with roti/chapathis. We Maharastrians are famous for our Varan Bath – Dal with rice! 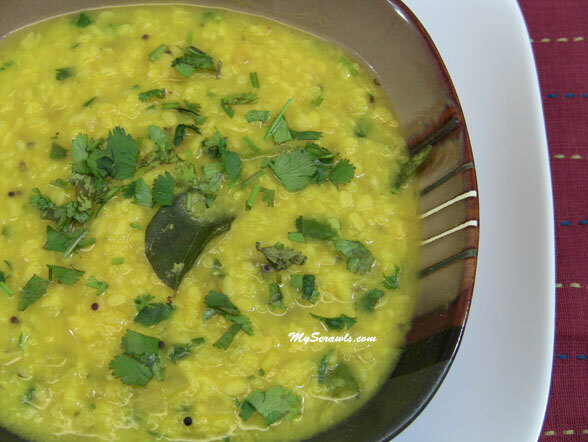 Mostly it would be toor dal (thuvaram paruppu), but moog dal varan also tastes delicious. 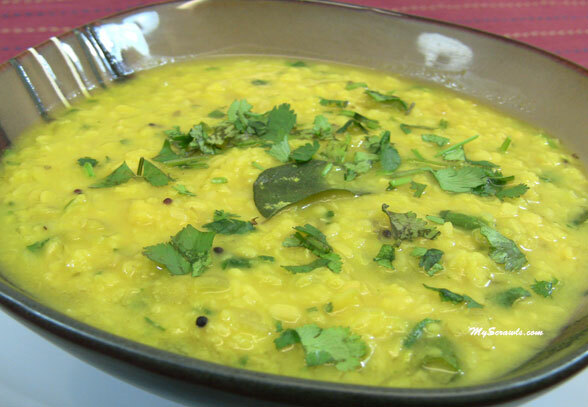 The basic varan recipe calls for dal, ghee and seasoning ingredients. But we can add vegetables like onion, tomatoes, cut beans or carrot, peas etc to make this simple varan recipe even more delicious and suited to our taste. Note: You can also use red chillies. Pressure cook moong dal adding turmeric to it. Toss in onions, chillies and curry leaves. Add salt and sauté onions till transparent. Keep stirring for 2-3 mins. Varan Bath: Varan mixed with hot steaming rice (Bath) and ghee! Add Varan (Cooked as above)and ghee to hot rice. Mix well and serve hot! Simple and delicious recipe.. looks awesome !!!!!!! Thanks for t recipe:)..tried n it’s delicious..